As discussed in this post, Xiamen Xingjingdi Group Co Ltd (XJ) and various co-defendants affiliated with Eton Properties Ltd (together, EP) have been involved in a long-running dispute in multiple fora, including a PRC-seated CIETAC arbitration and several Hong Kong court proceedings. The case appears now to have come to an end, with the Court of Appeal (Court) confirming its position on common law actions to enforce arbitral awards and rejecting both parties’ applications for leave to appeal the Court’s 15 April 2016 judgment. Herbert Smith Freehills has appointed Christian Leathley to the role of US Head of International Arbitration in New York. Christian, who is also the Head of the firm’s Latin America Group, is based in Herbert Smith Freehills’ New York office, where he has been based since 2015. Prior to relocating to the New York office Christian was based in the firm’s London office. A highly-regarded international arbitration specialist with nearly 20 years of experience, Christian focuses his practice on international commercial and investment arbitration servicing clients’ interests in all countries throughout Latin America. He also regularly appears as an advocate before all major international arbitration tribunals, with particular experience in the practice of public international law. Herbert Smith Freehills is accepting applications for short-term internships with the firm’s international arbitration group in Hong Kong. Three to four paid internship positions are open for three to four months each (not extendable), beginning in or around January, May and September 2019. Interns will work alongside our Greater China international arbitration team. They will have a varied workload, including assisting with current arbitrations and other client work; arbitration-related research; writing blog posts and articles; producing arbitration-related internal know-how, and similar projects. For more detail, please refer to the Herbert Smith Freehills Careers page (click “Apply Now” and search Hong Kong openings). Applications must be submitted via the Careers page on or before 31 August 2018. This year marks the 60th anniversary of the Convention on the Recognition and Enforcement of Foreign Arbitral Awards 1958, commonly referred to as the “New York Convention”. 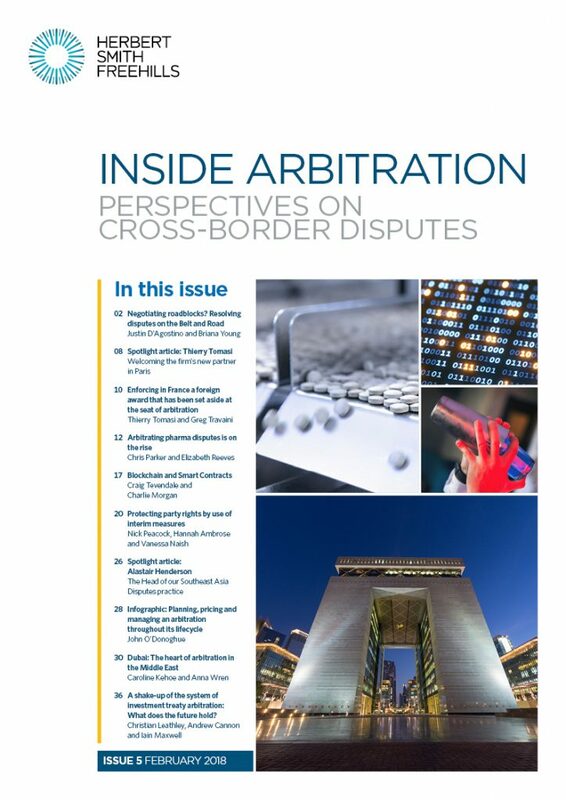 As one of the most successful international treaties of the 20th century, and a primary tool in the promotion of arbitration worldwide, the Convention established a regime to facilitate international enforcement of arbitration awards in 159 countries. This event will discuss the impact of the Convention in Southeast Asia, and whether its objectives have been successful in practice. Following a keynote address by Justice Anselmo Reyes of the Singapore International Commercial Court, a series of presentations and panels will discuss the history of the Convention; how it shapes the day-to-day conduct of international arbitration; practical experience of enforcement in ASEAN states (with data from a new survey); and future prospects for similar regimes that aim to support international litigation and mediated settlements. This event is jointly hosted by Singapore Management University (a premier university, internationally recognised for world-class research in the field of international arbitration); Singapore International Dispute Resolution Academy (a non-profit organization supported by the Ministry of Law, and Asia’s global thought leader for learning and research in negotiation and dispute resolution); and Herbert Smith Freehills (one of the world’s leading law firms, with a global reputation for international arbitration). The event will be a SILE accredited CPD activity. For more information on the programme and speakers, please click here. Please RSVP by Tuesday, 29 May 2018 to secure your seat. Spaces are limited and will be offered on a first come, first served basis. Global Arbitration Review (GAR) has unveiled its annual ranking of the world’s leading international arbitration practices, with Herbert Smith Freehills ranked in the top three for the third year in a row. The firm’s GAR 30 ranking appears in the 11th edition of the GAR 100, which was revealed last night at the eighth annual GAR Awards ceremony at the Four Seasons George V hotel in Paris. Highlighted again by the publication as a “force to be reckoned with”, GAR reports that the firm has seen an “influx” of high-value work “on the back of some high-profile results”. GAR reveals that the firm’s portfolio of pending investment treaty work is “as large as it’s ever been” – with nine cases worth more than US$1 billion (including one worth US$18 billion). The firm also achieves a large number of peer-recognised specialists across the global network, having a total of 13 people featured in ‘Who’s Who Legal’. On 6 March 2018, the Hong Kong International Arbitration Centre (HKIAC) and the Institute of Modern Arbitration of the Russian Federation (IMA) signed a Cooperation Agreement that aims to support and promote the development of international arbitration and other dispute resolution options in Russia and Hong Kong. This is a further development in HKIAC’s on-going efforts to meet growing demand in the Russian market for disputes to administered by established Asian arbitration institutions, such as HKIAC and the Singapore International Arbitration Centre (SIAC), which has signed a similar cooperation agreement with IMA. In recent years, HKIAC has built up a panel of 30 Russian-speaking arbitrators, translated the HKIAC rules into Russian, and hosted and participated in a number of events in Russia. HKIAC has also announced that it is developing a new set of Administered Arbitration Rules, with innovative features “that will bring a new level of arbitration experience to users in Russia and other parts of the world”. According to a recent survey by the Russian Arbitration Association, Russian users have indicated that Asian centres including SIAC, HKIAC and CIETAC are viable alternatives to the more traditionally-used European arbitral institutions such as ICC, SCC, LCIA and the International Commercial Arbitration Court at the Chamber of Commerce and Industry of the Russian Federation (ICAC). In addition, the survey indicates that Singapore and Hong Kong are increasingly popular seats, and the laws of these jurisdictions are respectively the sixth and seventh most popular choices among the survey respondents. In Arjowiggins HKK2 Ltd v Shandong Chenming Paper Holdings Ltd  HKCFI 93, the Hong Kong Court of First Instance has granted an anti-suit injunction in favour of a recipient of a Hong Kong arbitral award to restrain the continuation of the overseas proceedings by the losing party. The Court held that such proceedings were essentially commenced to re-litigate the same matters that had already been decided in a previous arbitration and ultimately to avoid honouring the arbitral award. The Supreme People’s Court of China (SPC) has released two judicial interpretations (Interpretations) on arbitration. The Interpretations were passed on 20 November 2017 and 4 December 2017. The texts of both were made public on 29 December 2017 and became effective on 1 January 2018. The Interpretations are the latest in a series of steps by the SPC to improve the regime for both domestic and cross-border arbitration in mainland China. Clarifying that the decisions of the PRC Courts under the “reporting system” are not subject to appeal.